This Cosy & Warm Living Room Area has sliding door access to the Balcony with a resort view. Upscale furnishings and a flat screen television complete the space. This Cosy & Warm villa has nice furnishings and a flat screen television complete the space. Master bedroom with king bed, ample closet space and lot room to relax in. Entry Hall to beach villa with private pool and tennis courts on property. Coligny beach park & plaza. Where all the action is!! Xanadu C11 is a flat style, 4th floor, beautifully furnished two bedroom, two bath villa. The villa has many updates which include renovated bathrooms and kitchen. 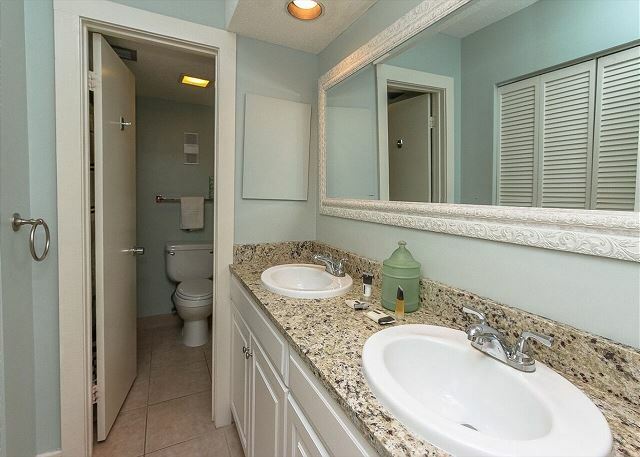 The bathrooms have new vanities, mirrors and granite counter tops and now have two sinks in each bathroom. 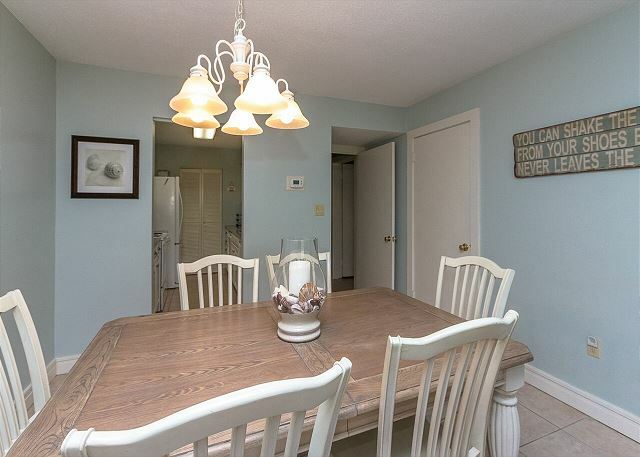 In addition, the kitchen has been completely updated with new cabinetry, quartz counter tops and new appliances. There is a flat screen TV in both bedrooms as well as the living room. The condo also offers WIFI for your convenience. The bedding in this villa consists of a king size bed in the master bedroom and a queen size bed along with a set of twin size bunk beds in the guest bedroom. Xanadu is a secure building with restricted access for car parking and access of building. Many walls in the building are concrete for sound buffering and safety. Just a 5 minute walk takes you to the pristine South Forest beaches. 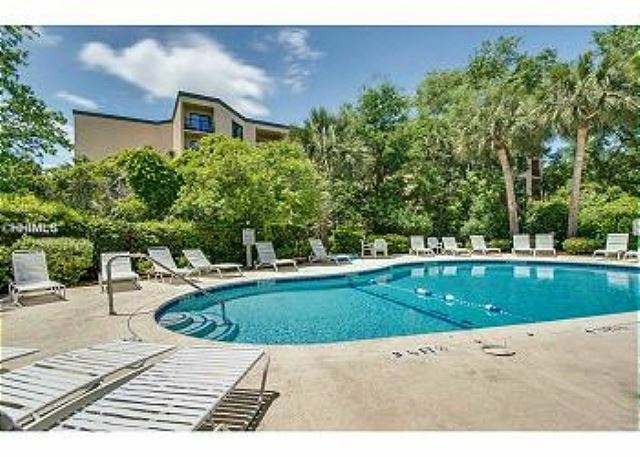 Nearby is Coligny Plaza which is the heart of Hilton Head with shopping and restaurants and a movie theater. Xanadu has a private pool and tennis on site as well as picnic areas and a grilling site. There are elevators for your convenience and laundry facilities on each floor. 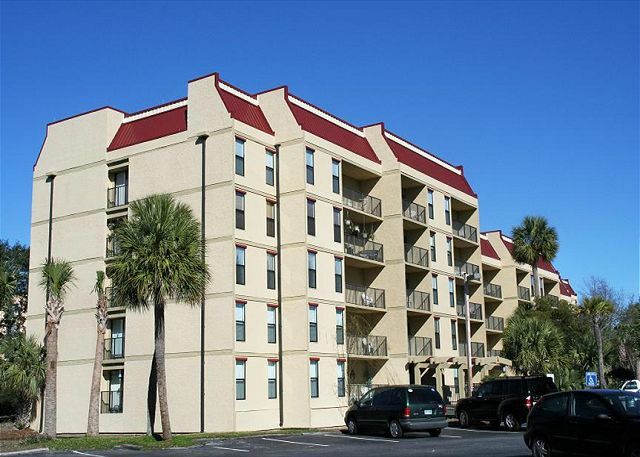 Conveniently located just a across the street, and just a short walk to the best beach Hilton Head. Rooms Sleeps 6, 2 Bedroom, 2 Bath, Poolside Xanadu Villa, beach oriented condo, kitchen, pool, free tennis and health club. We stayed in this condo with 4 adults, 2 toddlers and an infant. We felt like we had enough space, the condo was well stocked with kitchen supplies and movies etc. it's definitely an older complex but the renovations of this condo were very nice. It was a decent walk to the beach when toting all the gear that is required for small children, and you have to cross a pretty busy main road, would have been less of an issue if we were an all adult crew, but next time we will opt to stay right on the beach with our young kiddos for convenience. Not bad for the price tho! We had a great time in Hilton Head and our Xandu Villa experience was great! Plenty of room and very clean! It would be nice if stops could be added to the kitchen drawers. It is so easy to forget that they are not very deep and had to catch them a couple of times before they dropped on our feet. It would also be helpful if the sign out front could be moved out closer to the road so that you can see it as you are coming down the street! The pool was nice and clean and the walk to the beach was a short walk! Awesome place to stay! Enjoyed our visit to Hilton Head Villa was very nice and well equipped for two couples. Loved being near the ocean and also near shops and restaurants. stay was good, except for never getting the Wi Fi password. Someone tried but I was never able to sign on. The only other issue was the carpet in the other (non-master) bedroom has an edge that was pointed up and I almost tripped a couple of times. All that needed to be done was to rotate that part of the carpet to under the bunkbeds. We had yet another great stay at Xanadu in HHI. Thank you so much for great accommodations and a fantastic locale! We enjoyed our stay in this rental. It was roomy and clean! The complex is not directly on South Forest Beach Drive. It is behind another building so the walk to the beach was a little longer than we expected, but it is still close! We would stay here again! 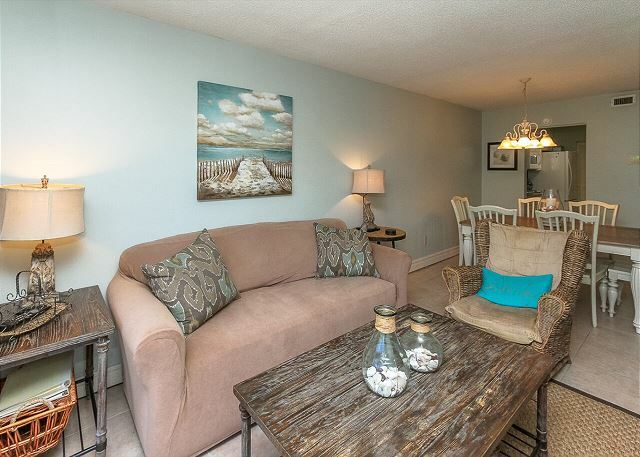 We loved how this condo was close to the beach and to nearby entertainment. The facility is a little bit older but newly renovated. I wouldn't mind staying here again. Great condo. Nice pool. Good location. Easy to the beach and shopping and dining areas. look forward to booking this one again. This Property is wonderful for a group of 4 people! I think it might be tight with six persons if all are adults. The location of the apartment is great, you have easy access to public beach within 5min walk and nice plaza with restaurants and shops within 10min. I book my vacation each year with Vacation time rentals and I always stay on the beach at Seaside Villas,this trip was not planned but the unit we got was very nice, 2bedrooms,2 baths,full kitchen and it was cheaper than the hotel down the road. We were straight across the rd from the beach which posed no problem and the property was very nice as well. We were very pleased and will continue to stay w/vacation time rentals for all our beach trip planning.